The historic centre of Palermo is a lot quieter than most of the areas. Although it is filled with tourists but there is a different vibe from the rest of the city. It is a lot similar to the Rashtrapati Bhavan area in Delhi- quiet, clean and green while the rest stands abuzz with activity. Walking in the historic centre of Palermo is like walking back in the time of the Normans. Your first stop should be Il Duomo di Palermo a.k.a. The Palermo Cathedral. The Cathedral is a breathtaking work of art and is surrounded by palm trees and old shops. The Norman cathedral is striking and gorgeous! Entrance cost is €5. It’s entrance includes a famous portico that was made in the 16th century. Inside the church are jewels from the era which are called the “treasures of the cathedral”. There is a crypt with tombs of the royal Normans which I personally found eerie but anyone can go and visit. To get a view of the city, you can climb to the top of a narrow tower for a view of the city. Cost is €5, however if you combine it with the Cathedral and tomb it is €7. Your next stop should be the long street with quaint shops and places to eat. Everything from street food to coffee to books to souvenirs can be found here. The street is quite long so make a few stops here and there. Once you walk for about 15 minutes, you will reach “Il Quattro Canti” – a junction where four (quattro) roads meet from four historic areas of the city. Quattro Canti is an area greatly admired by tourists and locals alike. It is adorned by sculptors and fountains that were commissioned by the Spanish Viceroy in 1611. It surely makes a great stop for photography and remains to my favorite part of the historic centre. Your last stop before lunch/dinner should be the Kalsa district that has the jaw dropping Pretoria fountain! Keep half an hour here only for gazing here and thank me later. I am pretty sure you will be stupefied by the architecture as I was. Palermo’s historic centre also includes several churches. The city is historically rich with an intriguing history. I think Palermo requires more attention but unfortunately it gets sidelined by the popular cities of Italy. -for a quick know how of the city take a Hop On Hop Off bus. -Getting around in Palermo is manageable by foot if you get a good Map of the city. -Several airlines caters travel to Palermo and from India I took the Swiss Airlines with a layover at Zurich airport. I found it to be the cheapest option (May 2016) as compared to other airlines. Check this handy Lonely Planet Guide for everything Sicilian you need to know. You won’t regret. –Language is a barrier in Italy if you don’t know Italian especially with the older generation. But the Italians try even if they don’t speak English, they will always help you. 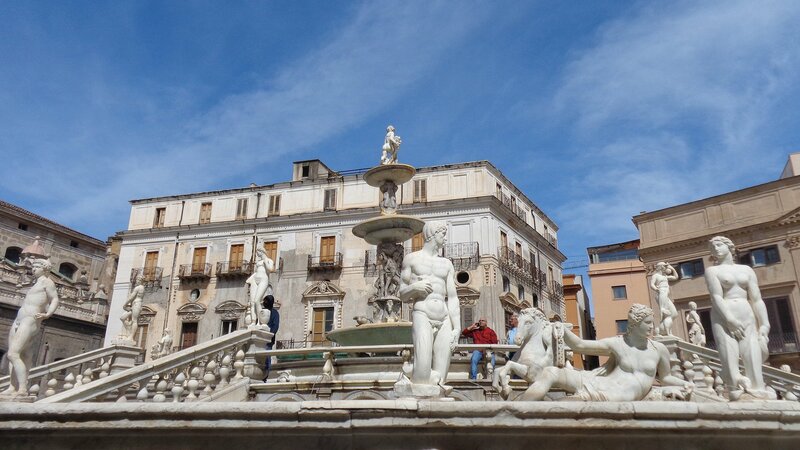 -For information and bookings consider booking your trip to Sicily via VisitPalermo & VisitSicily. They are are the best guides for anything Sicilian. Not only are they super helpful, quick to revert and easy on your pocket, but also locals who call Palermo their hometown. I guarantee they will suggest you the best of Palermo and Sicily on the whole for your trip! Thank you for your beautiful pictures and informative post! Since visiting Prato several years ago, I am missing the city and longing to go back! These pictures are just stunning and reflect all that I loved about my trip back then! I am currently reading The Birth of Venus, a fictional book set in the 1500s in Florence, Italy…I think I am part Italian, even if my gene pool says otherwise…. I have yet to visit Prato 🙂 Heard its lovely too. What place in Italy isn’t! I always want to visit every year. I think if I stay there, it might lose the charm. Checking online on Prato. grazie tanto. I have never been to Palermo (and Sicily) but looking at your pictures I think I will add it to my “to do” travel list! Thanks for sharing! Grazie Dave. Makes my day when you say that. Glad I helped increase your travels! Thank you so much. Have you been there? Hi Ishita – no I haven’t although it’s on the list 😀. Sicily is an island I would love to have the time to explore fully. Thank you so much 🙂 Palermo will feel like a different Italy and you won’t regret. I find it very interesting that you have the perception that many Italians speak English 😀 So many of my friends are very reluctant and would rather bury themselves if faced with the situation of having to speak English with strangers. By that I mean that they know small words of English which shows they want to try and help. I have seen a difference in past 3 years of my travels there and I think things are slowly changing and they do want to take it up .. the youngsters.. Thank you for the lovely appreciation.. I hope you visit it soon! Well one thing we’re great at is body language. The will to try to communicate is really strong even when faced with a language barrier haha But still, I’ve resided outside of Italy for some time now so I believe when you say things are changing. Haha absolutely 😉 Yes I think they are. I am glad they are. High time! It’s many years since I’ve visited Sicily and your post and lovely photos has got me thinking it’s time to return. How lovely it must have been. where all did you go? Beautiful area with stunning architecture, thanks for sharing. Thank you so much 🙂 also for the reblog! Have you been to Monreale by any chance? Really great and informative post! The photos are also incredible. I agree with what you said – Palermo gets sidelined due to the presence of other tourist hotspots in Italy (I confess that I am a person that has done this to poor Palermo). However, thanks to your post, it’s now high up on my list of places to visit. We didn’t make it to Palermo, but it looks great…next time. I remember you told me 🙂 we were in Sicily same time this year ..just different places. Lol! I’m in the same boat. Only today I saw a beautiful rail line in Tuscany online and was thinking when I could go. Same boat 😂😂 thank you for your lovely words. Make Palermo happen next time!! Great pictures! I’ve been to Palermo twice and you captured the atmosphere very well. Thanks for bringing back the memories! Thank you! Always enjoy your comments on my posts. Happy I could bring nice memories. Then pick Palermo and plan ab itinerary around it. i love it too 🙂 you must head to Sicily someday soon. . This made me grin, though: “Language is not a barrier in Italy as compared to other European countries. So many Italians know English and if they don’t, they will always find someone to help you when you are stuck.” I’m so happy for you to have this experience with the Italians you’ve met!! I wish I could say the same. Most of the Italians I meet in Roma and Tuscany are absolutely clueless, at least those who do not work in tourism. With a possible exception of France, in every other European country I’ve been people are happier to speak English and better at it. Yes you must 😉 Sadly it happens to me too but most of the people have been very helpful except for a few who give looks as if I am an alien 😛 I hope things improve. What a lovely blog Ishita! We thought Palermo was a magnificent city, especially having arrived on the overnight ferry from Naples. Unfortunately I did have my pocket picked! It was at the bus stop to go up to Monreale cathedral. There was an organised gang, an old man and half a dozen teenagers. They stole every passenger’s wallet or purse!